John Holland grew up in the Australian outback. He has been a stockman, miner, roadworker, professional hunter, newspaper columnist and media officer for a politician. His poetry and fiction are about life and the question of where we fit into an uncertain universe. Clinically depressed Shane Morris is trying to learn how to cope with his condition and find balance within the turmoil of his mind. He embarks on a mission to reconstruct himself by going back to his roots in the Australian outback town of his childhood. In Iris, this man who thinks he is nothing discovers at its extreme, life has two poles, the tender and the brutal. In the fires of the worst and best expressions of man, Shane learns he's far from nothing and just where he fits into humanity's broad spectrum. A lovely English governess goes missing from the homestead on a local cattle station in the Australian outback. The local people think the mysterious Min Min light has something to do with her disappearance. Senior Police Constable Mick Creedy doesn’t buy into paranormal explanations and is exploring foul play. However, when the young woman’s mother, Eveling, arrives from England wanting a full investigation, including the possibility of a paranormal event, Mick needs to balance his methods with a grieving parent’s needs. Eveling’s inclinations further complicate matters as they might lead her into a danger Mick does not yet understand. Pressure mounts as unexpected feelings for the victim’s mother raise the stakes in this case that seems to have no leads. A disfigured and abused boy, Dexter Knight grows to manhood with only his own mind as a constructive guide for how to live and how to be a man. When he loses his childhood love to cancer, he pulls up stakes and moves to the west Queensland town of Brighton. Dexter makes a place for himself there, but remains a lonely outsider on the fringes of society until a bitter and dangerous industrial dispute draws battle lines through the community. Strong-willed and independent Maree Waldon is one of the few townspeople who always took the time to talk to Dexter. Her boyfriend flees, but Maree sticks with family and friends. Escalating stakes prove the true mettle of all. Where will "the man without a face" and the young woman with a big heart stand at the end of this bitter war? Ten-year-old Buck Brown is the sole survivor of a plane crash in the interior of Australia's Northern Territory. Watching the plane sink into the murky water of a remote outback billabong, he remembers the pilot saying they had been flying off-course for hours. Search parties will never find Buck, he decides. There is only one way out, to walk several hundred kilometres home. With grim resolve, Buck sets out on a trek that will require resolve, knowledge, and ingenuity, a journey that will test his strength to the limit. He will be a participant in the elemental struggle for life and survival. Buck’s grueling trial will also teach him surprising lessons about friendship and loyalty. If he is successful it will be a trek that leads not only back to his family and home but also to a maturity not always achieved in a full lifetime. Giveaway ends January 17, 2016. Left of the Rising Sun - which is book four in John Holland’s collection/series of novellas titled Heartland - has now been released. Book trailer: Left of the Rising Sun, there is a place. 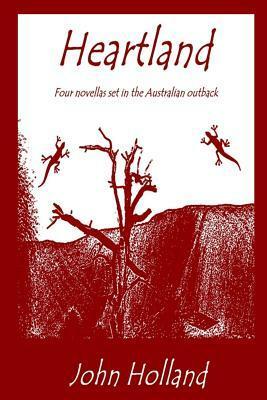 The four novellas comprising Heartland are linked by being set in the Australian Outback. Not by story line. Each is a complete story in itself. ~ Ten-year-old Buck Brown is the sole survivor of a plane crash in the interior of Australia's Northern Territory. Watching the plane sink into the murky water of a remote outback billabong, he remembers the pilot saying they had been flying off-course for hours. Search parties will never find Buck, he decides. There is only one way out, to walk several hundred kilometres home. Bitter Bread is book three in John Holland’s Heartland series. The books in the series are linked by being set in the Australian heartland, not by story line. Each book is a complete story in itself. After his wife’s death, all Dexter Knight wants is to make a living in peace, but the owners of the meatworks, the main employer in the west Queensland town of Brighton Australia, try to squeeze more labour for less money. The workers take a stand for their rights, and Dexter takes a stand that could cost him everything: his peace, his business, even his life. The Light at the Bottom of the Garden. Book two in John Holland’s Heartland series is now out at Smashwords and Amazon. A lovely English governess goes missing from the homestead on a local cattle station in the Australian outback. Mick Creedy doesn’t buy into paranormal explanations and is exploring foul play. However, when the young woman’s mother, Eveling, arrives from England wanting a full investigation, including the possibility of a paranormal event, Mick needs to balance his methods with a grieving parent’s needs. Eveling’s inclinations further complicate matters as they might lead her into a danger Mick does not yet understand. Pressure mounts as unexpected feelings for the victim’s mother raise the stakes in this case that seems to have no leads. nothing and just where he fits into humanity's broad spectrum. It is also available as autographed print copies at the following link. Welcome folks. My name is JOHN HOLLAND. I’m a writer from Australia who believes poetry should be sans frontieres. Words without borders. daylight, after our peaceful sleep. show of creation in the act. along in the gestalt of all that is, as it (and we) is (and are) being created. all on the way to the great finale: joy. My first book Dry Bones reached #1 in the Amazon Bestseller List > poetry > Australia and Oceania. Dry Bones and other titles. rest, to listen to the sounds of the bush, the sounds of this poet's heart. Maddison Brown. Artist and Writer. The Dordogne Region, France. deserves to be published, he deserves to be read. ~ Nicolette van der Walt, South Africa, Author of “fire lily: flower of the flame” and “To read a Lily”. different to what we have come to expect from current poets. connection to an uncertain universe. A deeper look into the concepts of time and space, cause and effect. place. This is a collection that takes Australian poetry to a different level. of a new era in Australian poetry. Len (Snowy) Thomson. Writer, Australia. there is such a thing as a Cowboy Zen guy, well John Holland is surely that man. to survive the heat of betrayal and surrender in love. Author of “Empty as Nirvana” and many other poetry collections. animal, from a premature discovery of the facts of life. each other." (Kindle Locations 721-726). possible to push your fingers through/ the elastic membrane of the universe."